Last weekend, we went to an art festival down by the river. The sun decided to make an appearance, and we walked the steps between the booths of artisans under its warm glow. It was Mother’s Day, so we went down as a family but my wife shooed us off occasionally so she could inspect every object from every artist at every booth while my son and I hopped down the steps and leaned over the ledge to watch the ducks and the fish in the brown, murky water. Every so often, my son and I would wander back up to where we saw my wife last and play a game to see who could spot her first. We would join her and look at a few of the booths before again wandering off to look for toys or games or artistic curiosities. On one of our excursions, we came to a section of steps that was near the empty stage that had music being piped through the speakers. 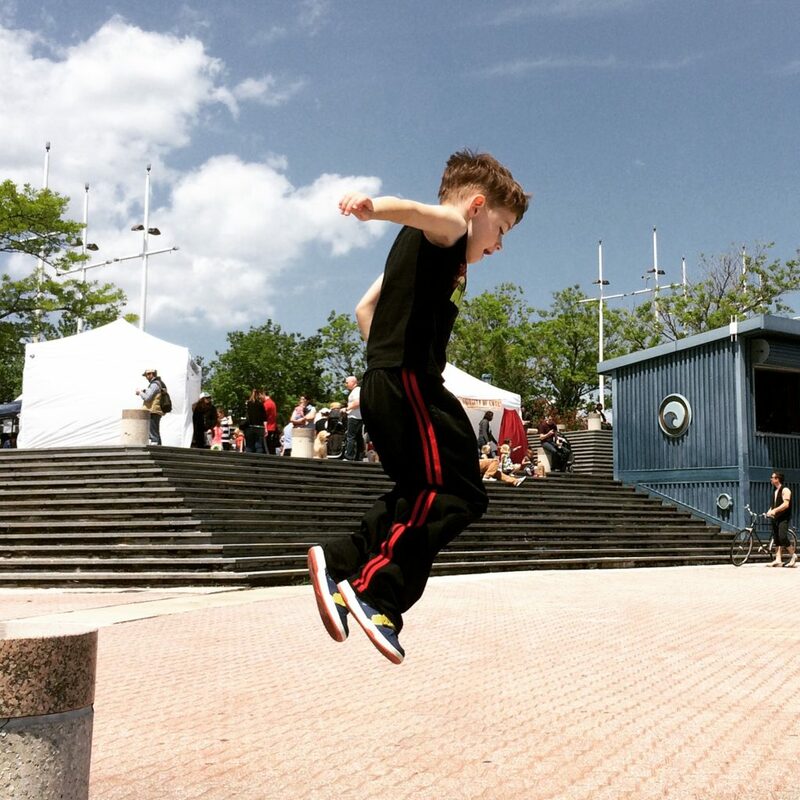 My son asked me to take pictures of him jumping off a pillar near the steps because he’s six and he is a boy and that is what boys do. As he finished inspecting the proof of his daring feat, a new song pumped through the speakers. 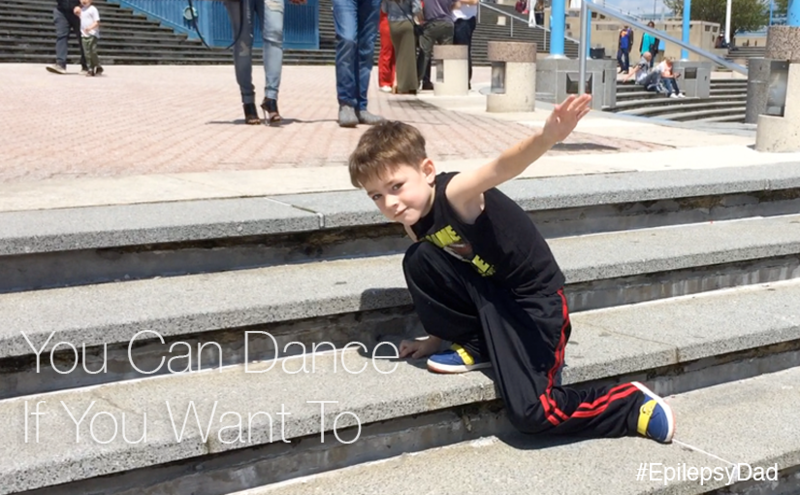 Without hesitation, my son started to dance. When I say dance, I don’t mean that he danced in place. Rather, a year of hip hop classes all culminated in a Jamiroquai-esque virtual insanity explosion of choreographed maneuvers from the top of the steps all the way down to the bottom where he ended his performance with a set of finger snaps and a bow. I was never that brave. I would have been (still am) too embarrassed to dance in public. Even though my ten-year plan includes a TED talk, I’m terrified of being in front of people or being the center of attention. Clearly, my brave, brave son doesn’t have that affliction. Sure, he has his moments. He gets nervous or self-conscious when he drinks his oil in front of his classmates. He sometimes won’t do something brand new in front of other people, although, usually he says he won’t but winds up trying it anyway. 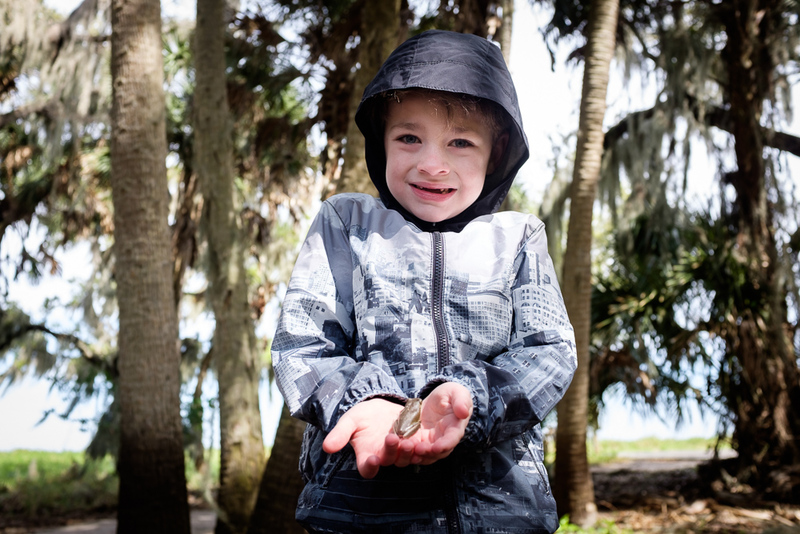 As a parent, there are a lot of things I want differently for my son than I had growing up. I never really felt secure or safe. I didn’t feel like anyone really had my back, or that it was okay to try something and fail. I always felt different, and that being different was a very bad thing. I desperately wanted my son to grow up free from the fear that gripped me as a child and that rears its ugly head so many years later. 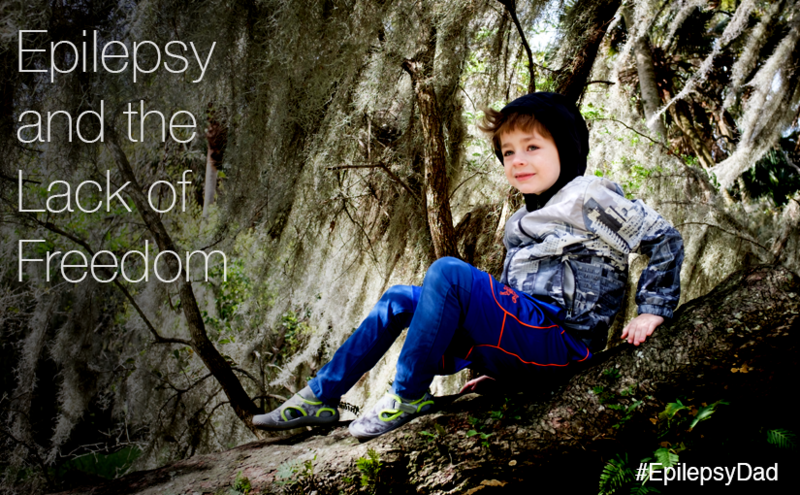 I think it’s even more important that he feel safe, and secure, and supported, and special because he will be made to feel different because he has epilepsy. Feeling different is okay; feeling “less than” or bad or wrong is not. Most days, I wonder if I’m doing it right. I wonder if I tell him to “stop” too much, or if he sees my discomfort when eyes turn our way because he is being silly, or inappropriate, or simply because he is being six. But I am encouraged when he feels the need to dance and does it as if no one is watching (or maybe because everyone is watching). When he does, I feel like maybe, just maybe, he’s on the right path. 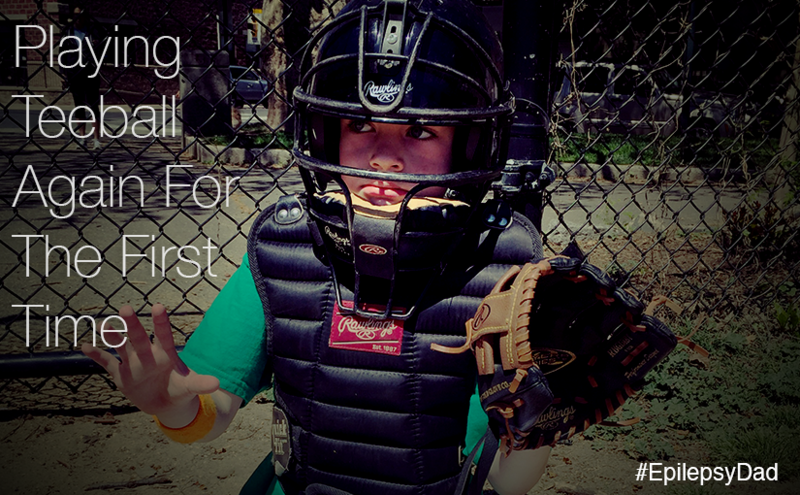 Last year, we signed our son up for teeball. He was only out of the hospital for a few months and was still having seizures and suffering from severe ataxia and behavioral issues from the seizures and medicine, but we wanted to give him a bit of “normal”. There were times when he would be in the field, in the “ready position”, wobbly and shaking from the ataxia, and he would have a seizure…the audible cue, his body glove slumping down and his body sagging. These seizures were short, he would spring right back up, back in position and waiting for the ball. If we tried to get him to leave, he would say no so we would monitor him and he was usually able to finish the game. When the game was over, though, he would be so exhausted, and the exhaustion was sometimes followed by episodes of his extreme, angry behavior. We’d put him in the stroller to take him home, and he would be saying mean, hurtful things, or spitting, or hitting. We’d get him in to the house and hold him until the storm passed and he was able to calm down and take a nap. There were good moments, too. Towards the end of the season, the coaches used a pitching machine instead the tee. Most of the kids would go up and strike out since it was obviously their first time trying to hit a moving target. But I’ve been pitching to my son for years…the tee we had was too big so we just pitched it to him and he would hit it. So he would step up to the plate, ataxic and off-balance, like a drunk stumbling down the street. He would go through the motions to get his feet set, his hands around the bat that he would lift up to his shoulder, and sway back and forth waiting for the pitch to come. When it did, his soft, fluid motion would bring the bat in perfect contact with the ball and he would crush it, and the look on his face made every other thought disappear. 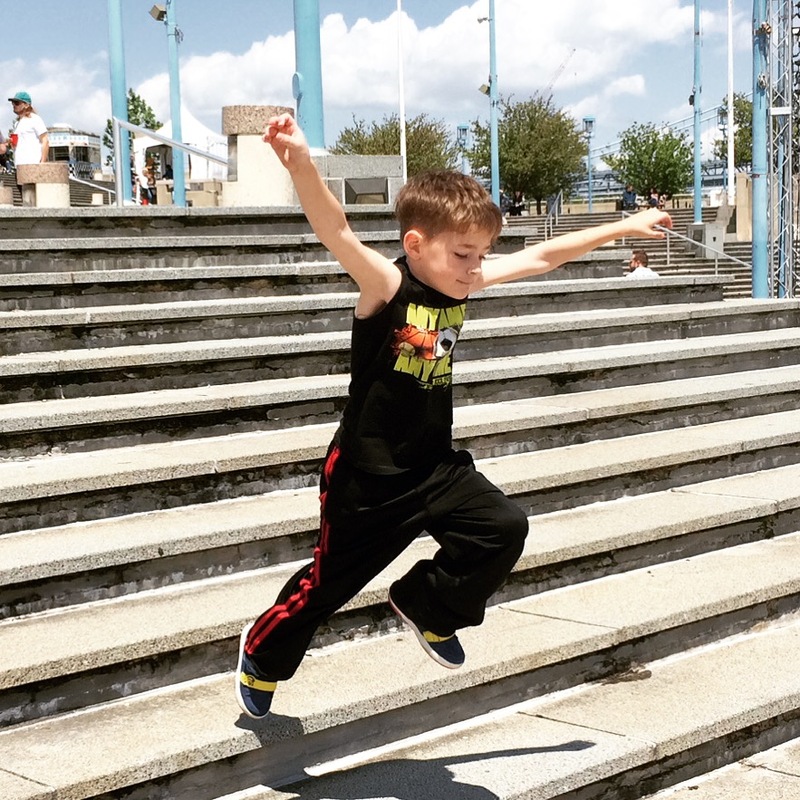 It was a balancing act…trying to give him an opportunity to do something fun with other kids but managing his seizures and minimizing the behavioral issues. There was no right answer. I felt like I was a terrible parent for putting him in the situation, and I felt equally terrible on those days where we’d skip the games and he would sit inside, isolated, lonely, and just as angry and having just as many seizures. We’ve come a long way in the last year. My son is again playing teeball. His ataxia is better but still visible, but his behavior is much more under control. He’s cheering on the other batters and saying “Batter up!” and “Good job!” as the other team crossed the plate. 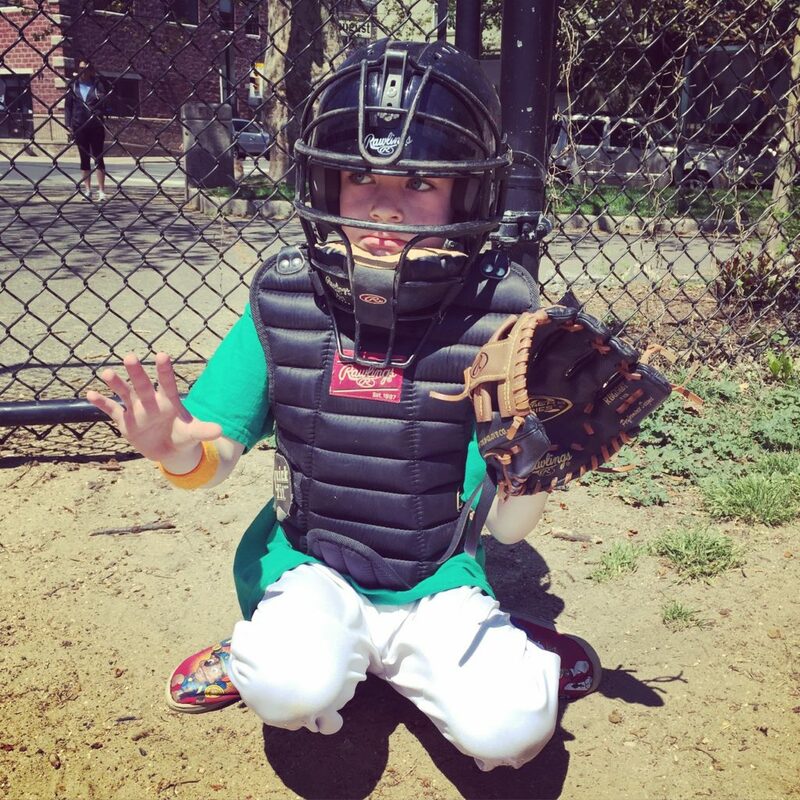 There have not been any on-field seizures and, after our last game, he played at the park with his friends because we didn’t need to rush home because of seizures or to brace for the oncoming fatigue-induced anger. My son doesn’t remember much about his first year of teeball, one of many holes that was caused by the seizures and the medicine. There are times when I wish I could forget last year, as well. But even though he doesn’t remember, I saw moments of joy and a sense of accomplishment as he hit the ball or ran to a base, and those are the memories that I choose to think of when I look back. If any memories from that time do come back to him, I hope that is what he remembers, too. But if he never remembers last year, and if he only remembers his experiences this year, I’m grateful that we have this opportunity for him to play teeball again…for the first time. One day last week, after I dropped my son off at school, I walked past the playground and the late kids being hurried by their parents across the street. The kids were a few years older than my son and, on the walk home, I began to think of when I was their age and lived in an apartment complex in Connecticut. I remember there was a common area between the apartments and the street that was covered in grass, with a big, green boulder that I used to climb, imaging it was the tallest mountain. My friends and I used to meet on the grass and play baseball, or tag, or ride our bikes on the sidewalk through the buildings. My sister was among the older kids that used to also congregate by the boulder, usually either ignoring or taunting their younger siblings. But there were no parents. Many of our parents, including my mother, were single parents or low income parents trying to make ends meet, so they were working or inside catching up on chores and other duties. So we were left to go outside, and play together, and to fill up our days with whatever we felt like doing. If the older kids got to be too much, my friends and I would grab our fishing poles and walk through the woods adjacent to the apartments to a small creek where we would catch frogs and small fish and where I swear I saw a river monster (which was probably actually something like a muskrat). There was a sledding hill on the other side of the complex, and patchy wooded areas that we could explore with plenty of trees to climb. Our ability to roam without parental supervision or babysitting by our older siblings made us feel very free. We don’t have any spaces like that near our house, and living in a big city is a completely different environment than the area around those apartments when I was my son’s age, but I wondered if my son would ever get to experience that same sense of freedom that I had when I was living in those apartments. Even if there were places to roam and their weren’t busy streets to navigate, will his seizures prevent him from being able to run off and play without the watchful eye of my wife, me, or another caregiver? Will he always have to be around other people, particularly someone who knows what to do if he has a seizure? I’ve always said that I didn’t want epilepsy to make my son feel “less than”, or for it to keep him from doing anything he wants to. But the reality is that it might, especially if we continue to have such a hard time getting his seizures under control. He probably doesn’t notice it as much now, because he’s six and because he’s not supposed to venture out in to the world by himself. But as he gets older, and as he’s not able to experience the same freedom that his friends do, I’m going to need to find a way to make it okay.